The Kansas Republican Party, like the State of Kansas itself, has reached a crossroads in this general election. For seven of the last eight years, the harsh conservative ideologue Sam Brownback successfully overrode moderates in his own party to conduct a failed “experiment” in supply-side fiscal polices that led to huge budget gaps and ultimately large cuts in basic public services, notably education. Even before Brownback left to join the Trump administration, Democrats joined with many Republicans to repeal his signature tax cuts in June of 2017, overriding a gubernatorial veto. And on fiscal issues, at least, Brownback’s appointed successor, Lieutenant Gov. Jeff Colyer, seemed disinclined to continue bristling ideological warfare as his party’s chief appeal. But then in a photo finish GOP primary last month, Colyer was defeated by a candidate who among other things wants to return to Brownback’s fiscal policies: Secretary of State Kris Kobach, the notorious immigrant-basher and vote-suppressor who is a close friend and associate of President Trump. And it’s significant that the last Republican governor of Kansas to serve before Brownback, Bill Graves, has now endorsed Kobach’s Democratic opponent, Laura Kelly. Graves, a moderate Republican in the tradition of senators Nancy Landon Kassebaum and James Pearson, served two terms as governor (1995-2003) before facing term limits. Conservatives who had been gradually building strength won the 2002 gubernatorial primary, but their champion, state treasurer Tim Shallenburger, lost to moderate Democrat Kathleen Sebelius, who was easily reelected four years later. Then in the GOP landslide election of 2010, former Sen. Brownback consummated the right-wing conquest of the Republican Party and of Kansas. Though the factional lines in the Kansas Republican Party have been clear and sharp for some time, the Graves defection (this is the first time he’s endorsed a Democrat for statewide office) is an eyebrow-raiser: typically unhappy moderates have just quietly gone along with right-wing nominees, as Graves did with Shallenburger in 2002. And it is significant also that Graves is backing a Democrat rather than an easier option: independent candidate Greg Orman, who is a major threat to split the anti-Kobach vote. 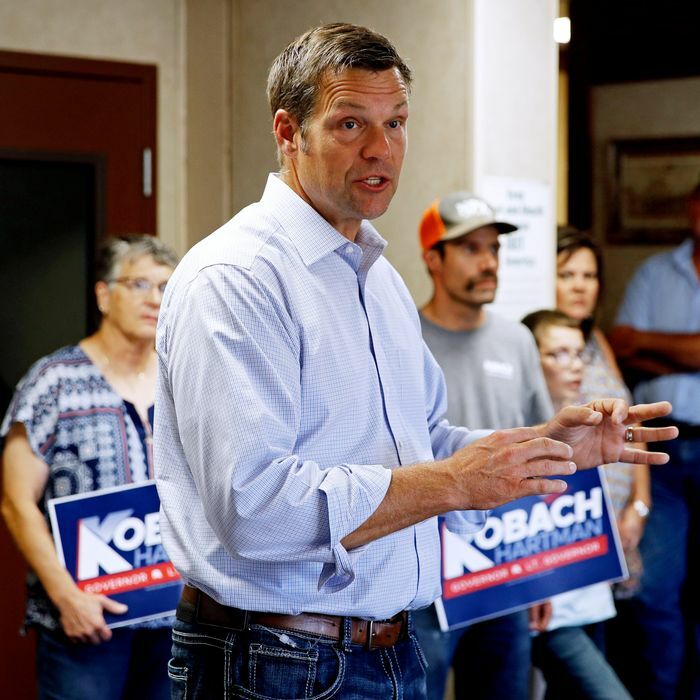 “This banded effort is a clear sign to voters that Kris Kobach is the candidate of change,” the party said. “With Kris Kobach as governor, Kansans get all of the failed policies of Sam Brownback plus Kobach’s unique brand of hyper-partisanship and self-promotion,” Ms. Kelly said. The outcome in November could well depend on how many moderate Republicans and Republican-leaning independents prefer not to go back down that road.